PFC experimentalists in the Trapped Ion Quantum Information group have performed a gate that flips the state of a single atomic qubit in less than 50 picoseconds. The time to perform this same operation with continuous wave (CW) lasers, a standard for these types of atomic systems, is typically over 10,000 times slower. In conventional computers a bit can be in the state 0 or 1, but not both simultaneously. By contrast, a quantum bit, or qubit, can reside in a combination of the two states.Qubits can made from any quantum system having two energy levels. 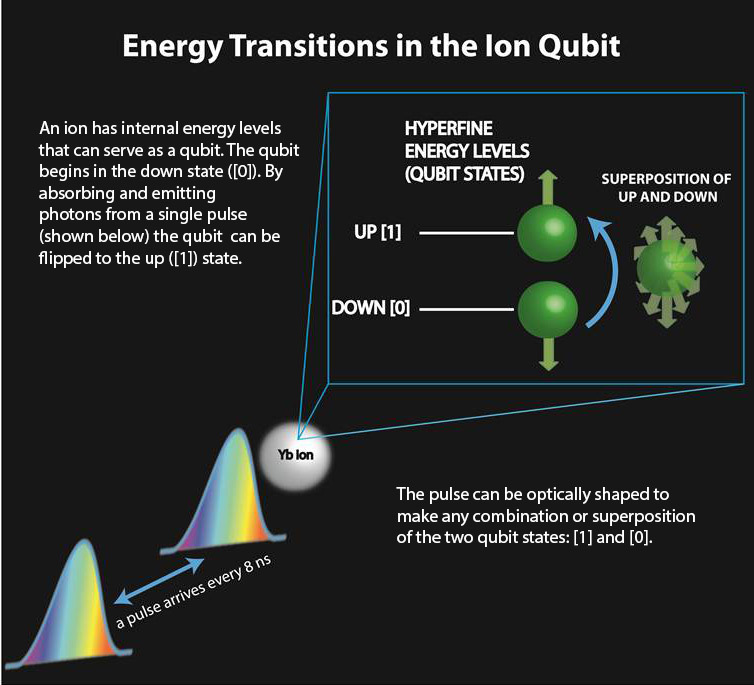 In this experiment, the qubit is a laser cooled, singly ionized Ytterbium atom having two ground state electronic levels labeled  and , or up and down. The state of this system can be controllably manipulated with lasers or microwave radiation. The researchers drive qubit rotations using a highly energetic single pulse or by optically dividing the pulse into two counterpropagating pulses. The gate, whether performed with CW or pulsed lasers, is a process that requires two photons. Here, the key technology is an ultraviolet laser that emits a pulse of light that is 10 picosecond longevery 8 nanoseconds. Within each individual pulse there are photons that have the frequency separation required (12.6 GHz) to coherently manipulate the qubit.